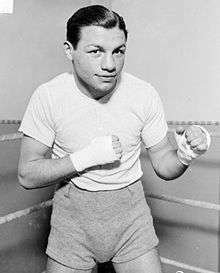 Tony Canzoneri (November 6, 1908 – December 9, 1959) was an American professional boxer. A three-time world champion, he held a total of five world titles. Canzoneri is a member of the exclusive group of boxing world champions who have won titles in three or more divisions. When he was a teenager, he and his family moved to Staten Island, New York, where he campaigned most of his career. Canzoneri fit the mold of the typical American boxer of the era: He could box up to three or four times in one month and up to 24 or 25 times in one year and he would seldom fight outside New York City, considered to be boxing's mecca at the time. As a matter of a fact, of his first 38 bouts, only one was fought west of New York City and that one was in New Jersey. Canzoneri won his first title, the World Featherweight title, with a 15-round decision over Benny Bass on February 10, 1928. He retained that title one time and then went up in weight and challenged World Lightweight Champion Sammy Mandell, losing by a decision in ten rounds. But in 1930, Mandell was knocked out in the first round by Al Singer and lost his title and Canzoneri, who had already beaten Singer by a ten-round decision before, challenged Singer for the title on November 14, 1930, knocking him out in the first round to become a two division world champion. In defeat, Singer made history by becoming the first man, and only man up until John Mugabi, to both win and lose the title by knockout in the first round. Canzoneri lost his world Light Welterweight Championship to Johnny Jadick and he lost to Jadick again in a rematch. Meanwhile, Canzoneri kept retaining his lightweight belt, defending it against the likes of Billy Petrolle and his brother Frankie Petrolle. Jadick lost his belt to Battling Shaw and Canzoneri once again challenged for the World Light Welterweight title while keeping his Lightweight title. He beat Shaw by decision and recovered the world Light Welterweight Championship. In his next bout, versus Ross, he lost both belts when Ross beat him by a ten-round decision. There was an immediate rematch and Ross won again, this time by decision in 15. Canzoneri kept fighting and winning and on May 10, 1935, he found himself in a ring for a world title again, this time against Lou Ambers, who had earned the World Lightweight title that once had belonged to Canzoneri. Canzoneri once again won the World Lightweight title by outpointing Ambers over 15 rounds. After successfully defending his Lightweight title once, he lost it again in a rematch with Ambers by a 15-round decision. There was a rubber match between the two and Ambers once again won a decision in 15 rounds. Canzoneri went on boxing professionally until 1939, but he never again challenged for a world title. Among other world champions that he beat were Frankie Klick, Baby Arizmendi, Jimmy McLarnin and Kid Chocolate. Canzoneri had a record of 137 wins, 24 losses, 10 draws and 3 no decisions (Newspaper Decisions: 4-0-0). During his era, many states and countries still had no scoring on boxing fights, so each time a fight would go the scheduled distance in any of those areas where scoring was still not being held, the fight would be declared a no-decision. He had 44 knockouts, and only one loss by knockout. Tony was managed by Sammy Goldman.